The body is worked in the round to the under arm, then front and back are divided and worked back and forth in rows. The sleeves are worked in the round to the underarm, then cap shaping is worked back and forth in rows. 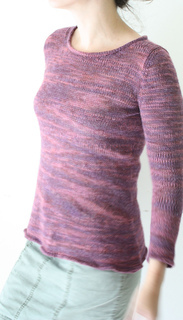 A sequence of sheer/opaque stripes are worked throughout. 32, 36, 40, 44, 48, 52” bust/chest circumference. 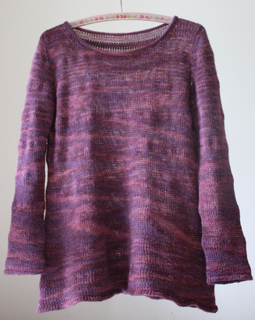 Pullover shown measures 36”. 3 (3, 3, 4, 4, 5) skeins. Edging: Size US 4 (3.5 mm): 24″ cir, 16” cir, and dpn. Markers, stitch holders, waste yarn, tapestry needle. 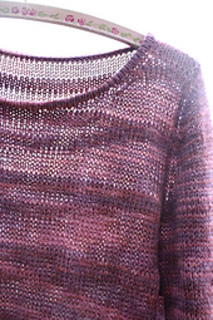 20 sts and 30 rows = 4″ (10 cm) in St st on larger needles with 2 strands of yarn held together.